Heading into 2017, only one event in UFC history had posted a Dwyer Score of -10 or lower. This weekend’s event in Sydney, however, will be the 4th event this year that has broken that barrier. I’ve speculated in the past that these kinds of scores may be representative of the UFC’s reluctance to release fighters on losing streaks, given Bellator’s recent propensity for snapping up free agents. The UFC can no longer release a fighter safe in the knowledge that he or she will simply bounce around the regional scene until the UFC is ready to welcome them back, as there’s now a legitimate competitor for those signatures. A few years ago, a 3-fight losing streak was a death sentence, but that’s no longer the case. Werdum followed an eventful unanimous decision win over Travis Browne with a majority-decision loss in his rubber match with Alistair Overeem in July- a decision that 7 out of 16 polled media members disagreed with. Werdum rebounded from this loss by defeating Walt Harris via first-round submission just last month, only a few hours after original opponent Derrick Lewis’ late notice withdrawal. Tybura notched his first UFC victory with a second-round head kick KO of Viktor Pešta last August. He followed that impressive performance with a TKO victory over Luis Henrique in March of this year and a unanimous decision win over former UFC heavyweight champion Andrei Arlovski in June. Here’s a look at how these two fighters fared when competing against common opponents shared throughout their careers. On the left of the graphic, you’ll see how Werdum fared against any shared opponents, and on the right, you’ll see Tybura’s results against the same men. Werdum and Tybura share only one common opponent; Andrei Arlovski. Tybura scored a win over Arlovski earlier this year, whilst Werdum was on the wrong side of a unanimous decision loss when the two met in Werdum’s UFC debut back in 2007- over a decade before Tybura faced the Belarusian. Each event, I calculate a ‘Dwyer Score’ for the card. It essentially gives a numeric value to the momentum of fighters competing at any one event. I do this by assigning a figure to each fighter’s current streak; a fighter on a five-fight winning streak contributes +5 to an event’s score, whilst a fighter on a two-fight losing streak contributes -2 to the score. A fighter coming off a No Contest, a draw, or a bout with another promotion has a streak of 0, and only UFC results are considered. 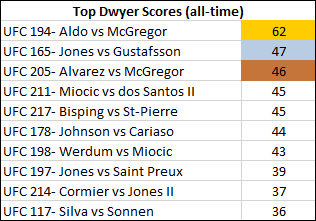 When you tally up the scores for every fighter on a card, you get a total for the event- the ‘Dwyer Score.’ This score does not claim to predict or measure the quality or excitement of any one card, but it does give you an idea of the general momentum of fighters heading into a specific event. Normally, I include a graphic here displaying some of the highest-scoring events of all time, but this week the table (above right) displays some of the lowest scores in UFC history. UFC Fight Night 121: Fabrício Werdum vs. Marcin Tybura has a Dwyer Score of -13, tied for the second-lowest score in the UFC’s 24-year (and 418 event) history behind UFC Fight Night 111: Holly Holm vs. Bethe Correia (-14). This score ranks joint-30th of 33 events in 2017 (level with Rodríguez-Penn and Cerrone-Till, ahead of only Holm-Correia) and joint-17th of 20 Fight Night events this year. This score falls way beneath the +4.4 average for Fight Nights in the last year, as well as the +11.4 average for all events in that same period. The highest individual contributor to the score is Marcin Tybura (+3), with Belal Muhammad and Alexander Volkanovski (both +2) just behind. The lowest scorer on this weekend’s card is Anthony Hamilton (-3), just ahead of Bec Rawlings, Jake Matthews, Will Brooks and Eric Shelton (all -2), whilst 5 fighters will be making their promotional debuts. Is it the most exciting event of the year? Certainly not, but perhaps that ought to be expected when an event is sandwiched between two mammoth Pay-Per-View cards. As we know, anything can happen in MMA and there are many exciting fighters on display here.